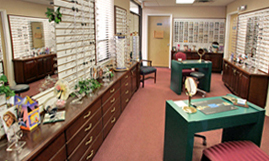 Our commitment to your vision has always been the policy at Pasadena Eye Center. Our board certified ophthalmologists and optometrist have always dedicated their professional expertise and time to maintaining the health of our patients' eyes so they have the best possible vision and to providing specialized care and/or treatment to those who need it. We believe that providing high-quality care is not only about the medical advice that we dispense, but more importantly about the relationships we have with our patients. 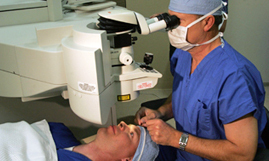 Pasadena Eye Center is pleased to offer cataract patients the option of bladeless laser cataract surgery. This is the most technologically advanced option for cataract surgery patients, providing unmatched accuracy so the procedure is customized to your eye. Please call or email the office today to schedule a consultation to see if you are a candidate! Our convenient location allows us to serve all of our patients in the Tampa Bay area and beyond. Our practice has served the Tampa Bay area since 1984, providing care to patients from 13 to 105 year olds. 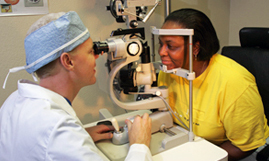 As the area has grown, so too has Pasadena Eye Center to accommodate patients' needs. Our physicians manage various eye diseases as well as performing cataract surgeries, glaucoma surgeries and laser procedures as well as refractive surgeries. We offer the latest in "custom" intraocular lenses as well as the latest technology for "bladeless" cataract surgery. Our optical shop has grown to provide a wider variety of frames and offers the most-advanced in digital lenses. In 2007, Pasadena Surgery Center opened, offering our patients the convenience of one-day surgery in a familiar setting.